Two of the busiest musicians in rock have collaborated on the new project called SWEET/LYNCH. Michael Sweet released his solo album I’m Not Your Suicide last year and STRYPER’s album No More Hell To Pay was released in late 2013. George Lynch has been just as busy in the past two years, after recording albums with LYNCH MOB and KXM. But these aren’t the only accomplished musicians in the band, as the rhythm section consists of legendary players James LoMenzo on bass and Brian Tichy on drums. Only To Rise consists of 12 songs, and is around 48 minutes long. The album opens with two of the best songs, “The Wish”, which features a killer riff from Lynch, and “Dying Rose”, a track which is reminiscent of DOKKEN. The songs are mainly up-tempo with a few mid-tempo songs mixed in, like the anthems “Strength In Numbers” and “September”, which recalls 9-11. There are two ballads, “Me Without You” and “Love Stays”, both of which work well. These songs all have a positive message and I think several of them could have easily ended up on the next STRYPER album, particularly “Time Will Tell” and “Recover”. My favorite song is the title track, which is the heaviest song on the album. Michael Sweet sings great and there are tons of hooks to be found here. He doesn’t use his upper register often on the album, but when he does, like in “Recover”, it is with great effect. Lynch’s signature riffs are all over the album, and his playing is clean and tasteful. Production wise, to me it sounds just like STRYPER’s last album, with a more “open” and slightly under produced sound. If I had any complaint, it would be that I would like to hear even more from George Lynch's guitar. 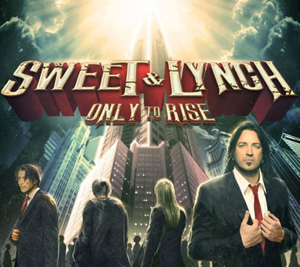 Overall, SWEET/LYNCH is a very successful project and this album is rock solid. It took a few spins for this album to really click with me, but once it did, I thoroughly enjoyed it. Only To Rise should appeal to anyone who enjoys modern melodic hard rock with references to the good old days. As a fan of all the musicians involved, I hope they make another album. Pick up a copy of Only To Rise in the KNAC.COM More Store right HERE.